2. Beat butter and peanut butter until smooth. 3. Beat in white sugar and brown sugar. 4. Beat in egg, milk, and vanilla extract. 5. Stir in flour, baking soda, and salt. 7. Drop by teaspoonfuls into a bowl of sugar. Roll until covered. 8. Place on parchment paper about 2 cm apart. 9. 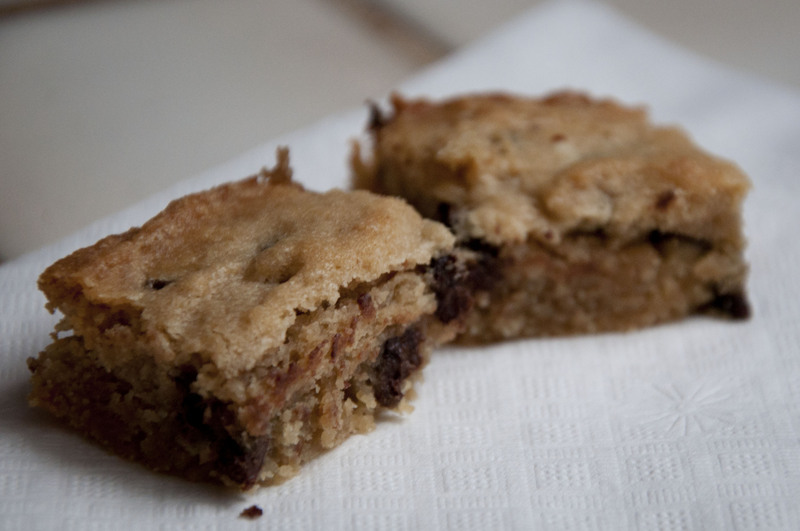 Press a chocolate chip into the center of the cookie. (Note: original recipe suggests pressing chocolate kiss immediately after removing from the oven). 10. Bake 10-12 minutes and let cool before moving. 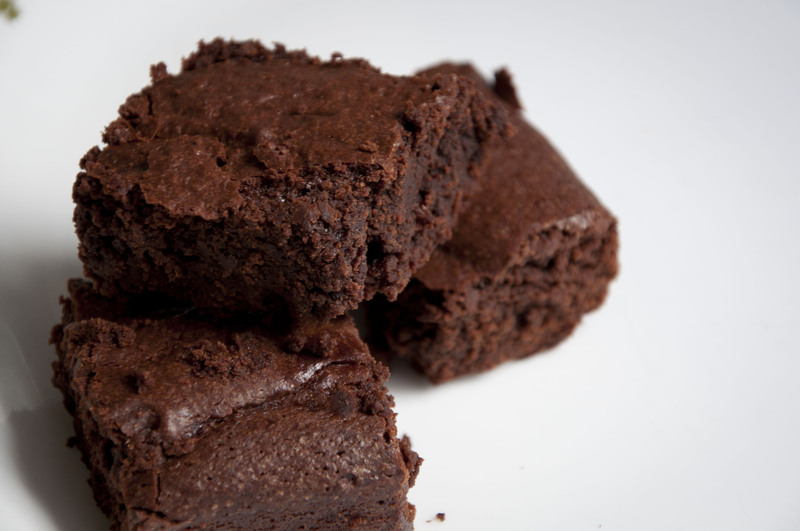 This makes a fudgy, dense, rich, and super-chocolately brownie. Plus, it’s very easy to make! 2. Melt butter in microwave or on low heat. 5. Beat in eggs until combined. 6. Stir in cocoa. Don’t stir to fast, or it will come flying out. 7. Mix in flour until just combined. 9. Bake 20-25 minutes, or until knife in the center comes out clean. 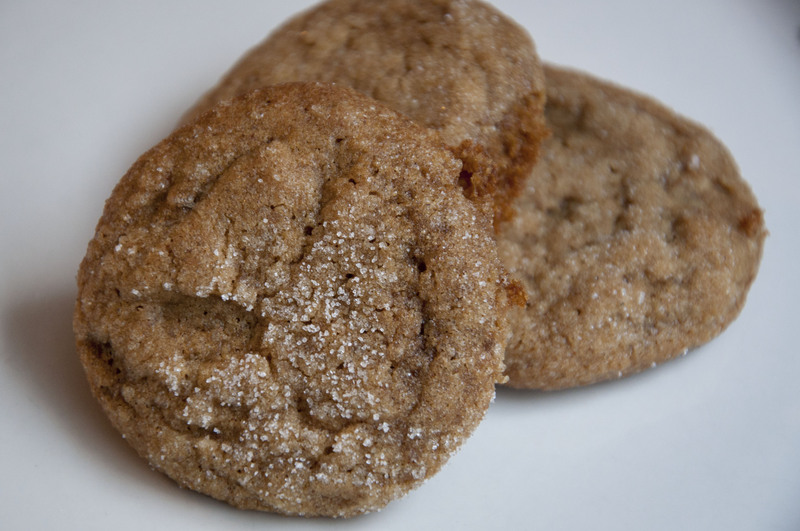 Deliciously soft molasses cookies are the result of this recipe! Nothing special. You’ll need to use your freezer. 2. Beat butter until smooth. 3. Beat in granulated sugar and brown sugar until smooth. Add in molasses and stir well. 5. Add baking soda, salt, ground ginger, cinnamon, allspice and pepper. Mix well. 7. Wrap dough in plastic wrap and refrigerate for ~1 hour (or freeze) until dough is firm. This makes it easier to handle and prevents too much spreading. 8. When the dough is ready, form balls using the dough. Roll balls in granulated sugar. 9. Place on prepared sheet and bake 10-15 minutes. At 10 minutes, cookies will be softer; at 15 minutes, they will be crispier. Space the balls ~1 inch apart so that they do not spread into each other. 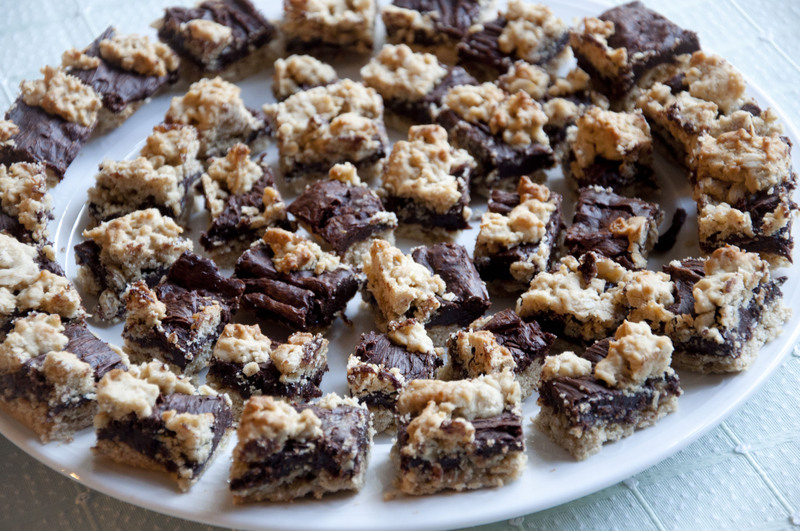 This recipe is very easy to make, and yields an oatmeal cookie base topped with a sweet and creamy chocolate fudge. 3. Add in brown sugar. Stir until smooth. 4. Add in vanilla and eggs. Combine thoroughly. 5. Stir in flour and oats. 7. 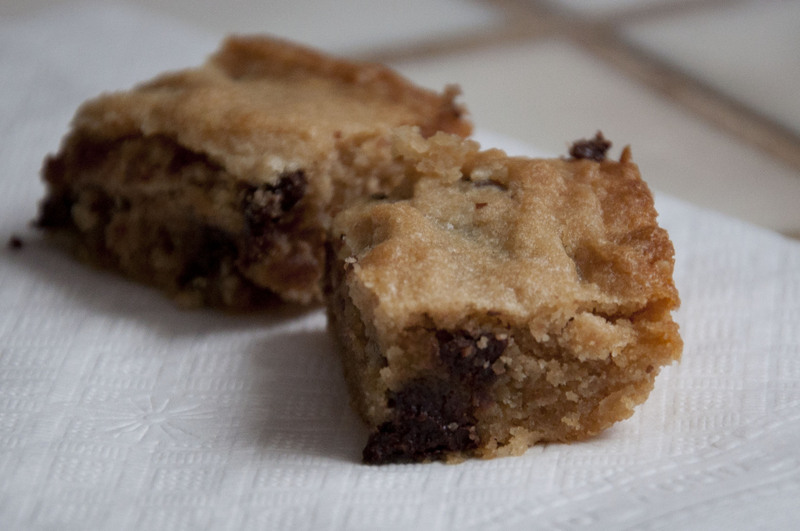 To make filling: Melt the chocolate chips, condensed milk, butter, and salt together on low heat. Stir until everything is melted. 8. Pour filling on the dough mixture. 9. Sprinkle the last 1/3 of dough mixture on top of the filling. 10. Bake 30 minutes. Let cool completely before cutting. It will be much less sticky when it’s cool. 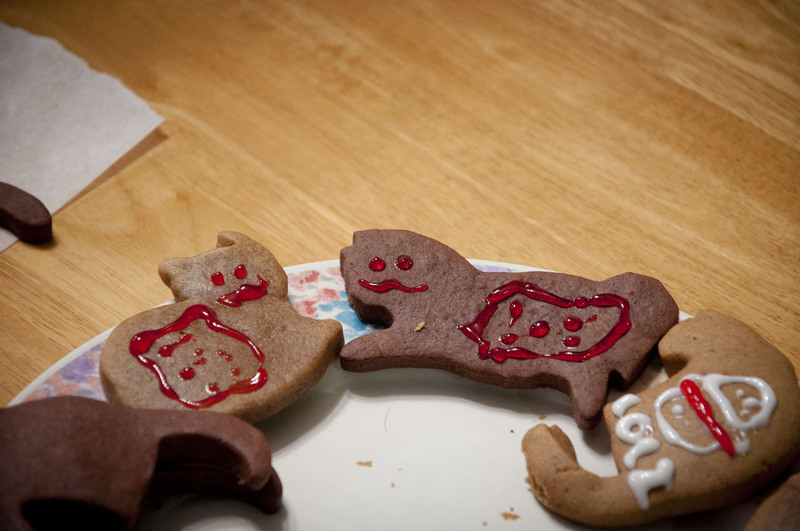 These cookies are made in the same way as gingerbread men, but they are chocolate instead! 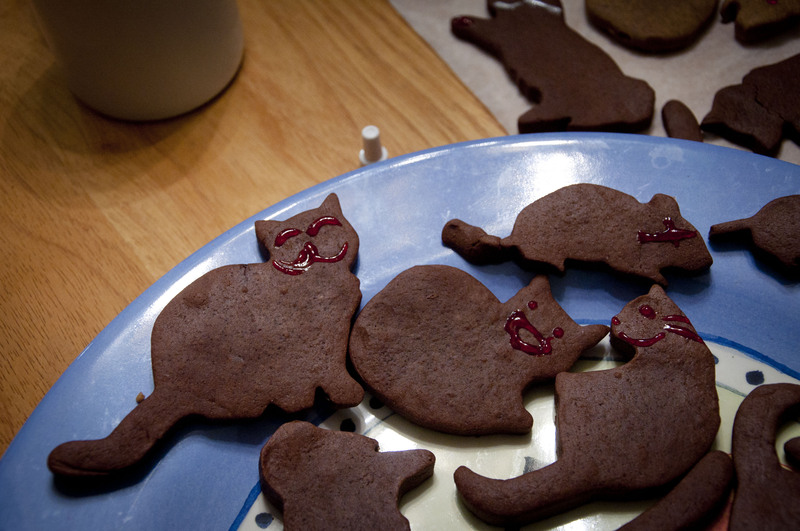 The cookies don’t spread, so it’s great for achieving the desired shape of cookie (in this case, cats). 2. Cream butter until smooth. 5. Mix in, baking powder, salt, and vanilla. 7. Divide dough into half and wrap in plastic. Refrigerate for ~1 hour (freezer works faster), until dough is firm. When the dough is too soft, you cannot roll it out. 9. Using the desired cookie cutter, press into the dough and make desired shapes. 10. Bake cookies for 8-11 minutes in the oven, until crisp. Let cool before frosting. Rich, spicy, and great for rolling into a variety of shapes, including cats! You can also build a variety of novelty shapes with the dough, which doesn’t spread during baking. 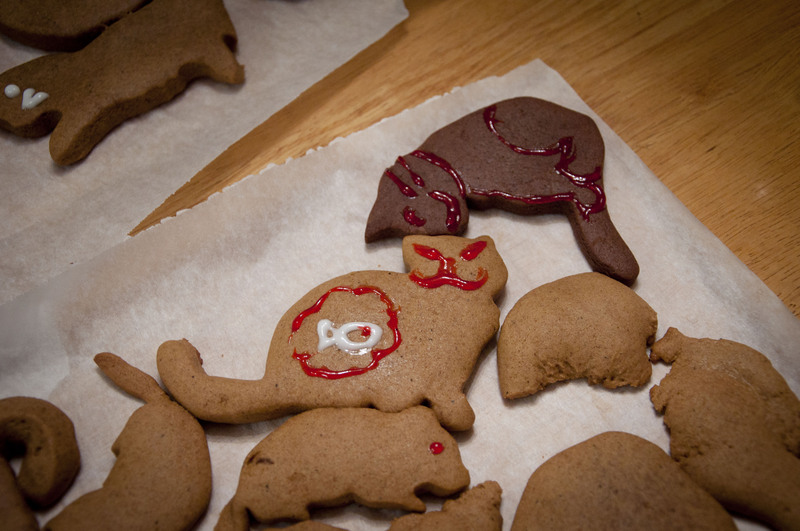 The cookies are strong enough to make a gingerbread house too. 3. Stir in brown sugar and molasses. Stir until smooth. 5. Mix in baking soda, baking powder, ginger, cinnamon, cloves, pepper, and salt. Stir until fully combined. 6. Stir in flour, cup by cup. If dough becomes too dry, stop adding flour. 7. Divide dough into thirds and wrap in plastic. Refrigerate for ~1 hour (freezer works faster), until dough is firm. When the dough is too soft, you cannot roll it out. 10. 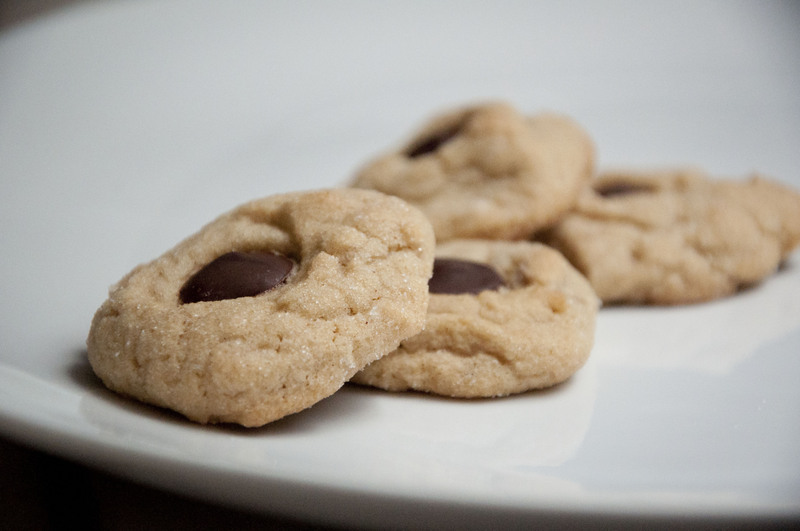 Bake cookies for 12-14 minutes in the oven, until crisp. Let cool before frosting. 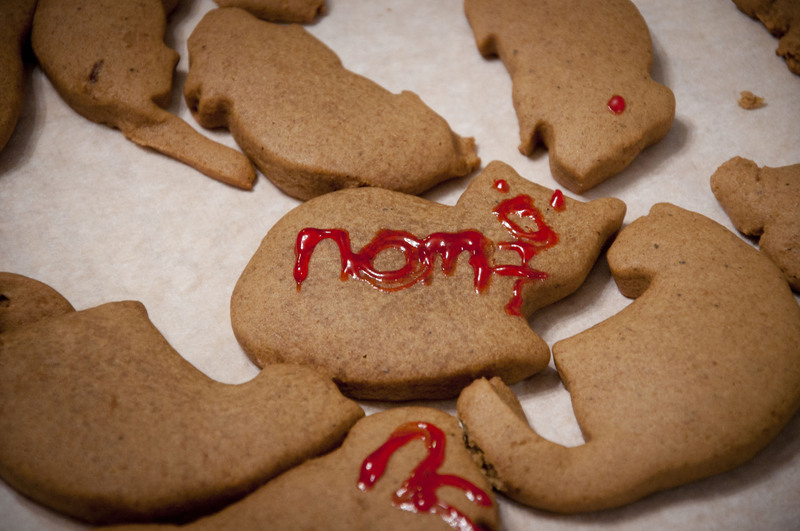 Adapted from Joy of Baking. Frosting from C&H Sugar. 1. Preheat oven until 350F. 2. Beat butter till smooth. Add in sugar and beat until smooth. 4. Beat in milk until combined. 5. Stir in flour, baking powder, salt and mix until just combined. 6. Divide batter into the number of colors you which to have. If you have 5 colors, then get five bowls. 7. Drop food coloring in each bowl and mix. Do so until the batter reaches the desired shade. 8. 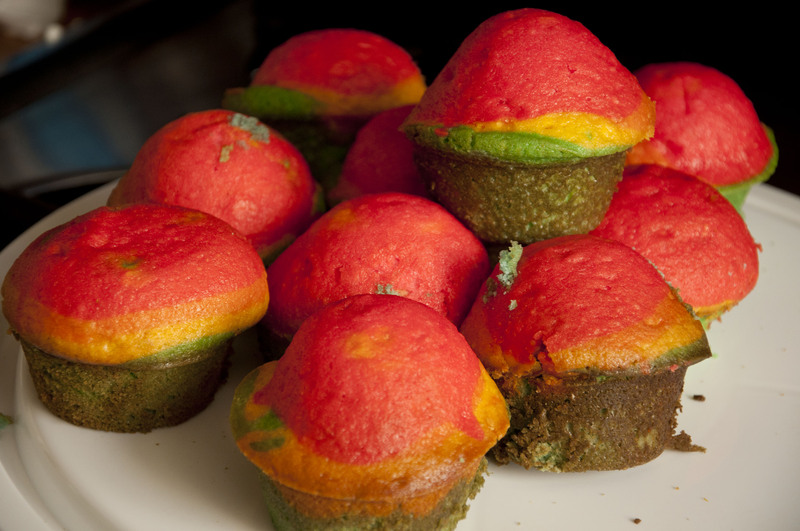 Scoop batter by the spoonful into prepared muffin pan, color-by-color. 9. Bake 18-20 minutes until knife or toothpick in the middle comes out clean. 10. To make frosting: beat milk and softened butter until smooth. Add vanilla. Beat in powdered sugar until smooth. 11. 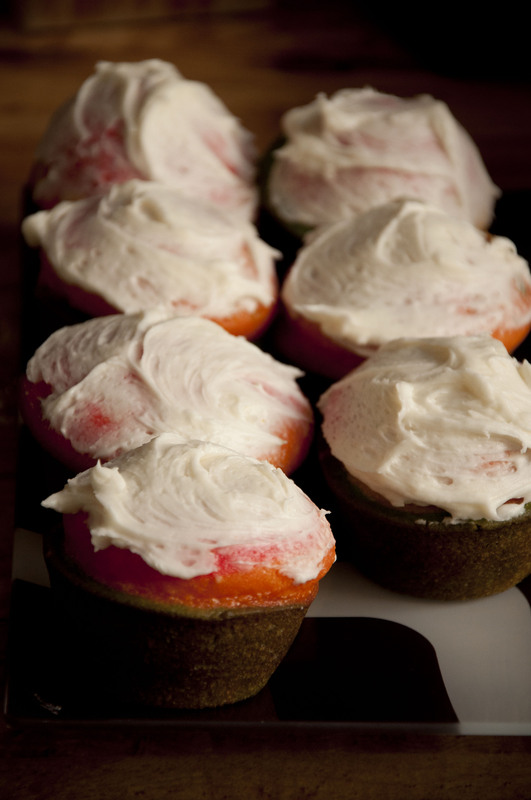 To frost cupcakes: using a knife, spread frosting on the tops of the cupcakes. • Some colors don’t turn out that well in baked goods (e.g. purple). These scones are fluffy and delicate, yet satisfyingly rich. In a large bowl, combine flour, baking powder, baking soda, sugar, and salt. My preferred: use your fingers to combine the flour and butter. At the end, the mixture should look loose, like flour. Use two knives to cut butter into tiny, flour covered pieces. Use a hand mixer to combine butter and flour. Mix in buttermilk, lemon zest, and blueberries until dough forms. Place dough ball on a piece of parchment paper (to avoid sticking), and flatten into a circle. The dough should be around ~1 inch thick, but it doesn’t matter. Cut wedges from the circle of dough. Brush tops of scones with butter (can also use a spoon or fingers if you don’t have a brush), and sprinkle tops with sugar. Bake for 25-35 minutes, until the scones are lightly browned. Be sure not to overbake, or they’ll be dry! 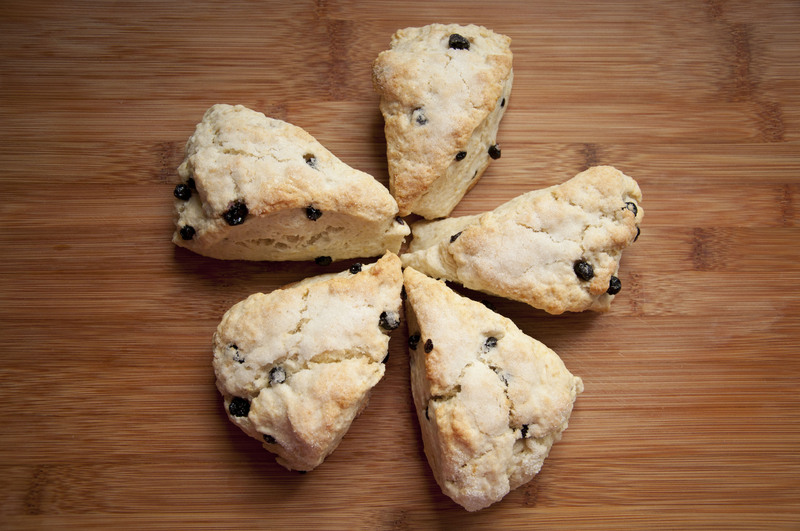 You can reuse the parchment paper used for cutting the scones to bake them. Use the same measuring cup to melt the butter and measure buttermilk. You can pre-zest lemons ahead of time and freeze the zest for later use.